A Great house for family reunions, women's (and men's) retreats, but cozy enough for single families. 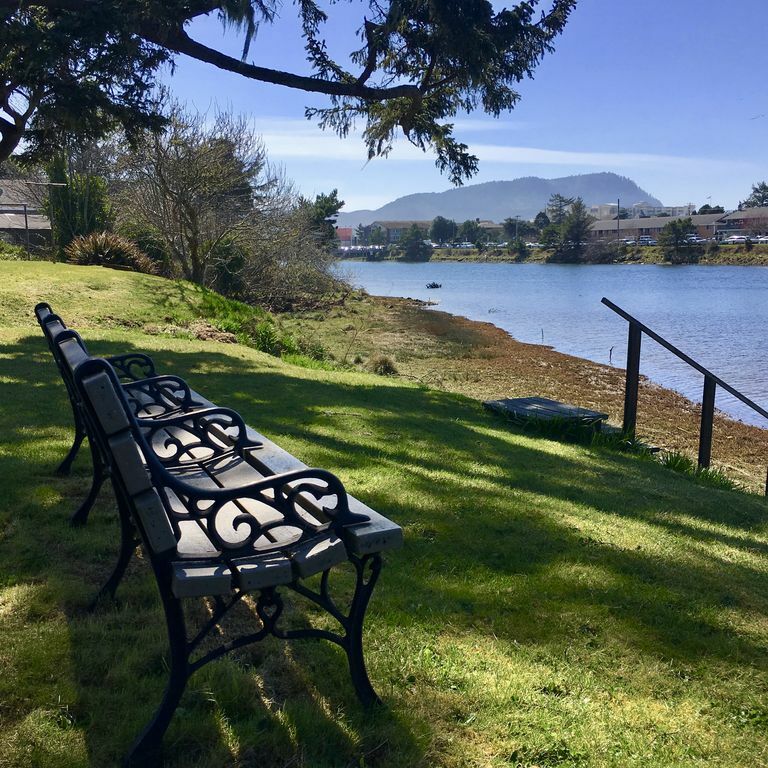 Come and stay in this beautifully renovated family home situated on the east bank of the Necanicum River in Seaside, Oregon. An easy walk to downtown and the famous Seaside Promenade. Everything you'll need for a relaxing family vacation or an adult getaway is provided. House features a fully-equipped big & bright kitchen with a breakfast bar, formal dining room, large living room, library, wraparound enclosed front porch. Watch the sun sparkle over the river from the deck or enjoy the large yard with a fire pit on the edge of the river. Enjoy a book in the library, play board games or just relax in one of the four uniquely decorated bedrooms with sleeping accommodations for 12 adults plus 3 small children. We are natives of Oregon but have lived in Washington, California, New Hampshire, Pennsylvania, Brazil, China and Mexico... Oregon has always been our favorite place on earth. We have always loved the scenic Oregon Coast and someday hope to retire in Seaside. Afternoon with the sun sparkling on the river is my favorite time of day. Each Bathroom has Shampoo, Conditioner, Toilet Paper, Liquid and Bar Soap, Air Freshener, Aloe Vera, Sun Screen, Hand Lotion and a Hair Dryer. Sunny Windows and Lots of Lighting. Also Each Bathroom has an Emergency "In Case You Forgot" Container Under the Sink Full of All Kinds of Personal Items. Dinnerware For 24, Stemware, Dish Towels and Wash Cloths. A Full Kitchen To Enjoy! Smart TV's in the 4 bedrooms. Smart TV with digital cable in the Living Room. Bicycles, Beach Toys, Sand Chairs, Clam Guns Roasting Sticks, BBQ. Bring Your Canoes and Kayaks. Only a Few Blocks to Downtown and Seaside's Public Dock. This home is big and comfortable. It is perfect for large families and has space to spread out and enjoy a relaxing vacation when the weather isn't so nice outside. The home is walking distance to downtown and the beach. Our children enjoyed the puzzles, games, books, Foosball table and many other toys that were available. The dining room table was huge and we were all able to sit and eat together. The owners are wonderful to work with and we would love to stay here again. We felt at home right away yet this house was immense, complete with a rec room downstairs for the teenagers. We had access to bikes, although the weather was a bit nippy. The kitchen was well-stocked with essentials for cooking and plenty of space for several cooks. The bedrooms were beautifully appointed. The one drawback was that there were only 2 bathrooms for 12 people. This house is located on the river and is withing easy walking distance to downtown and the beach. We shared the house with another family of four, so there were eight of us total and there was plenty of room for all. There was a fun selection of games, puzzles, books, sand toys, etc. The owner was fantastic to work with and clearly took pride in the property. We definitely plan on going back. This was such a amazing home. We all where very confortable in the home, plenty of room for everyone, no one was in no ones way. This house is very spacious, but the pics don't really show the real beauty of this place. We ate here and there was no problem with finding something to cook with, everything you could possibly ask for is there. The bedrooms where very comfortable, no complaints about sleeping problems, I know my bed was way comfortable and I sleept in the african room. We used the firepit in the back, quit a awesome view of the lights on the river. This place is very peaceful. We all had the most wonderful weekend, staying in your beach house with family and friends made our weekend very memorable. Where in the talks about a Feb. trip in 2013. We will be back. Getting this all figured out with Beth-who was absolutly wonderful to work with, was a great experience. Thank-you to both of you for the great time. Absolutely perfect,warm and inviting beach home. When I pulled in the driveway of this magnificent home,I had to double check the address. From the themed rooms to the inviting cozy library, where you pick up a book and curl up in the chair, would have been enough to relax us our entire stay. Large comfortable beds in every room. there were 6 of us this last weekend, we actually enjoyed the house so much we skipped the Saturday night event and rented a movie and hung in the house. My only regret was the time I had to stay at the Conference, I would have preferred to stay in the home the entire weekend. I suggest you just pay the small extra laundry fee so you do not have to worry about using your day up washing sheets ;) We already plan to reserve this house summer for our family . I guarantee you and your family will love it. Great Place. Best stocked home I've been in. Lots of TV's and double washer and dryers. Close to town and beach. On the river. Good river view and access. Good overall value. I will return. Owners great to work with. One suggestion...could use a new (larger) TV in living room.